Wine Strategy One: They say you should never judge a book by its cover. Well, that’s how I judge my wine. In true graphic-designer form, the best designed label wins. Though this theory is obviously genius (ha! ), it has let me astray at times. Even the ugliest wine can have its hair and make up done. Wine Strategy Two: Pick a price-point that works for you. I am 24. The majority of my legal-lifetime has been spent purchasing Cupcake, Yellow Tail, or dare I say it, Franzia. With millions of wines out there, it’s hard to know which to buy in bulk and which watered-down-red will end up in your drain. I will admit, the first time I was invited over to a co-workers house, I spent 20 minutes picking out an affordable red wine I thought would be nice enough. My name is Tarah and I’m an insecure wine-shopper. 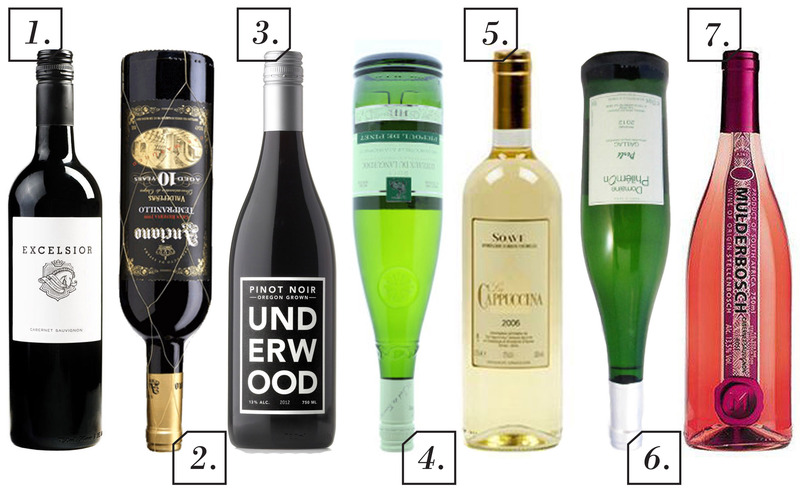 To help those my fellow to IWS-club members, (& with help from my local Bottles beverage superstore) I’ve picked the best wines for under $15. Sip them well, my friends! 1. Excelsior Cabernet Sauvignon • $9.99 • African • Tasting Notes: Full body. 2. Anciano Tempranillo • $10.99 • Spanish • Tasting Notes: Dry, medium body. • Bottles-Guru Notes: Tempranillo is the grape type. This bottle is a grand reserve and has been aged 10 years. 3. Oregon Grown Underwood Pinot Noir • $13.99 • Bottles-Guru Notes: Pinot Noir is one of the more expensive choices because of its grapes. It is the hardest to find under $20, but Underwood is a great brand that builds up in price. 4. Picpoul De Pinet • $11.99 • French • Tasting Notes: A crowd pleaser white wine that is comparable to pinot grigio. • Bottles-Guru Notes: France makes the best white wines. This is the easiest drinking French wine out there. It’s best at summer time. 6. Domaine Philemon Gaillac • $11.99 • Tasting Notes: a crowd pleaser, dry with a light sweet effervescent – it’s bubbly! 7. Mulderbosch Cabernet Sauvignon Rose • $9.99 • Bottles-Guru Notes: A dark rose is best for cocktails. Drink lighter roses with food.